I thought we were done with snow for the year. It turned out that Mother Nature had other ideas though with a brief return of the cold winter weather. Clearly this year is making up for those years where we’ve had no snow! One of the nice things about having had so much snow this year is being able to try doing different things in it. 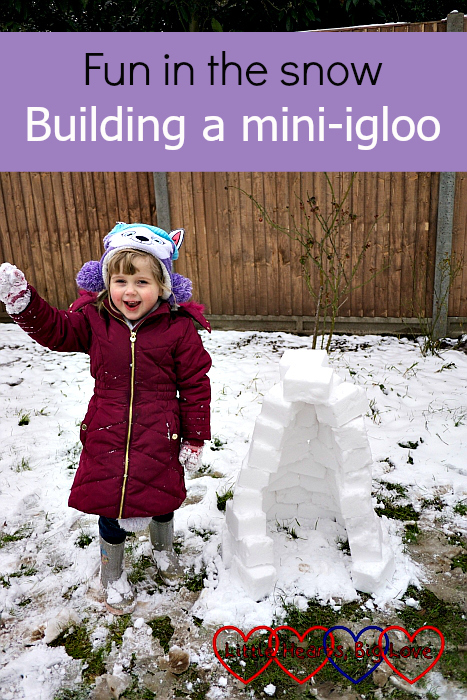 We’ve made a snowman, tried snow painting and eating snow ice-cream and this time I decided we could try making a mini-igloo. Jessica wasn’t up for getting outside in the snow. She’s not all that keen on snow as she gets too cold very quickly. She wanted to stay inside in the warm, watching us through the patio doors instead. If she changed her mind she would bang on the window to let us know, but she was happy just to watch. 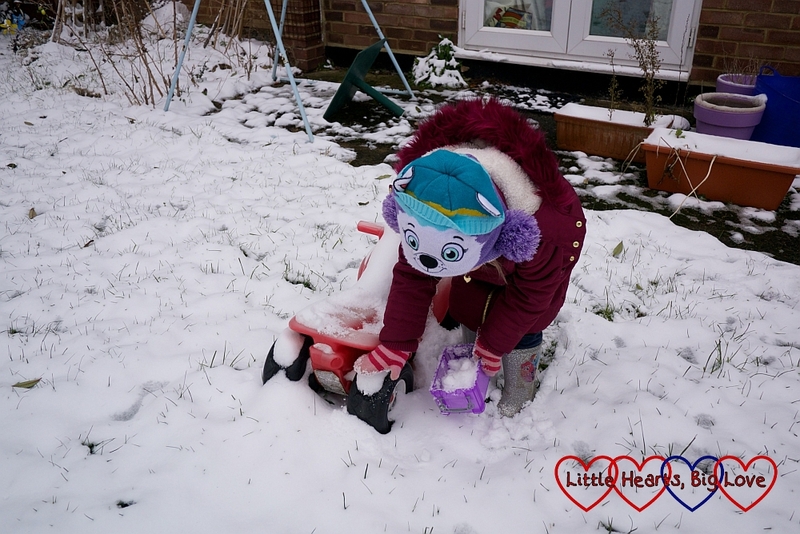 Sophie was very keen to get outside and play in the snow though, so I had one little helper! 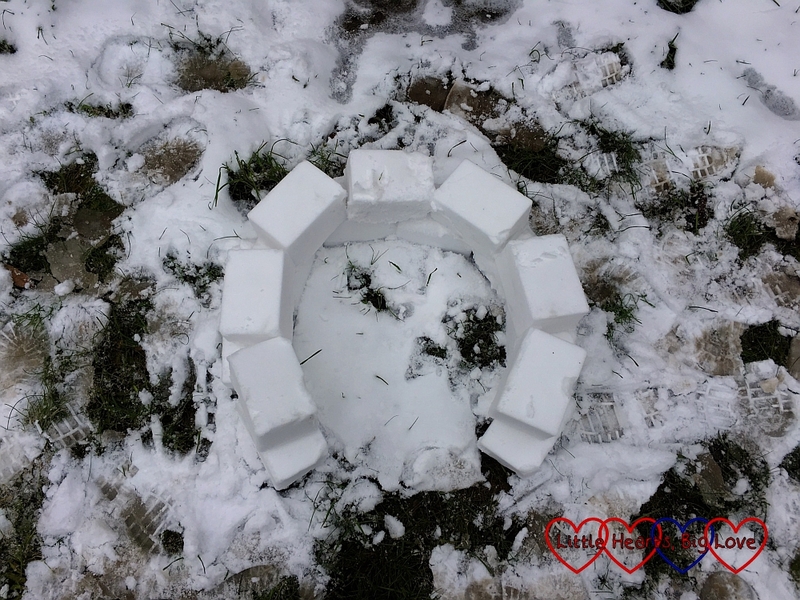 We used a small plastic box to make the bricks for our igloo. The one we used had handles on the side which made it a little trickier to line the snow bricks up closely. A container with smooth sides, such as an empty butter tub, would be better for this. 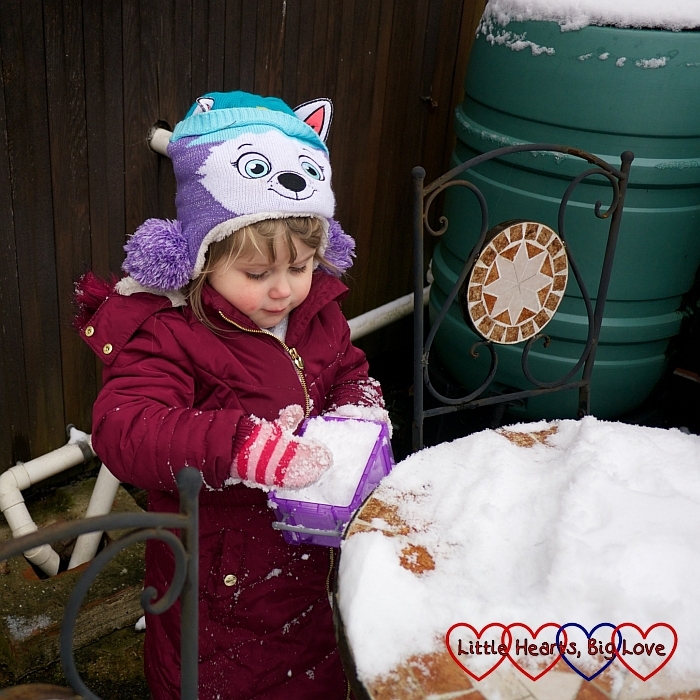 Sophie was in charge of filling up the box with snow and patting it down. The best places to collect the snow was where it had fallen on smooth flat surfaces. There was a nice thick layer on the garden table which made quite a few snow bricks! 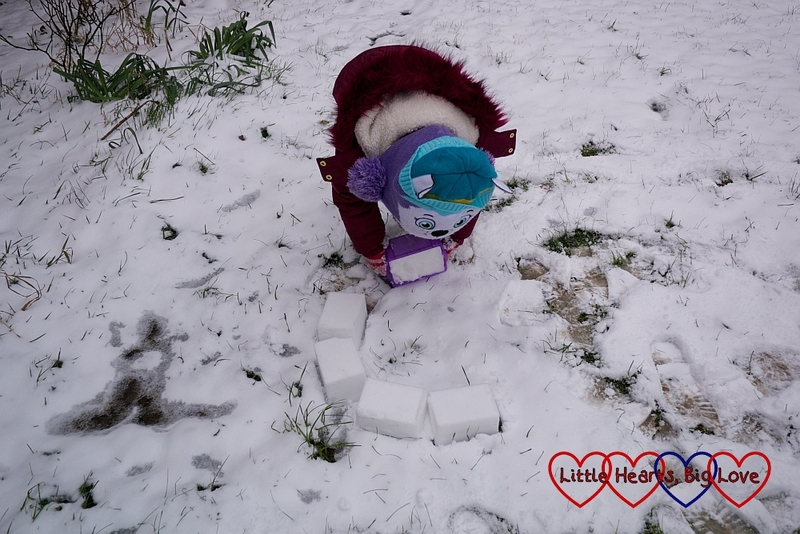 Once we’d filled the box with snow and patted it down, we turned it upside down on the ground to leave a snow brick. We tried to line the bricks up as close as possible to make the shape of the igloo. 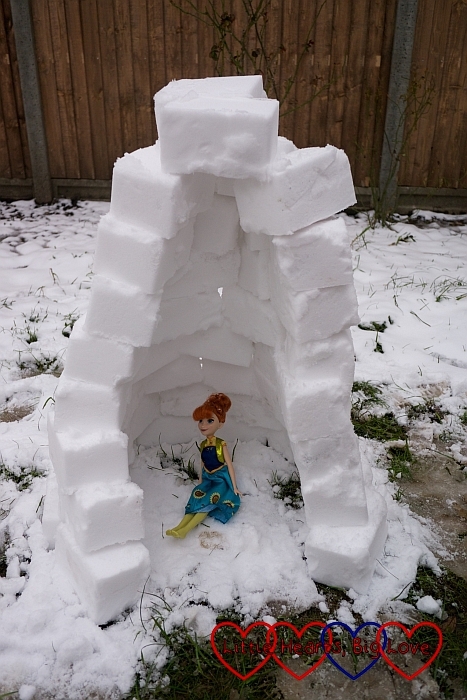 This was a little tricky for Sophie, so I did most of the igloo building while she made the bricks. Once we’d built the first layer, we then added bricks on top to make the next layer. With each layer, we aligned the bricks slightly closer to the middle of the igloo. Our finished igloo was a little taller and narrower than I’d originally planned but Sophie and I were pleased with it. It was too small for her to fit inside, but just the right size for one of her dolls. Anna was the doll that Sophie chose to try out the igloo first. 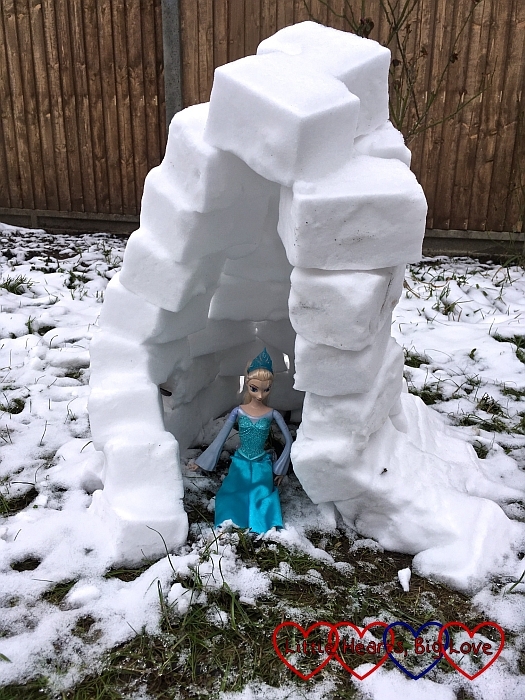 Later though, we realised that Elsa would have been much more appropriate! The snow was starting to melt by that time so the igloo structure looks a little more precarious. It did manage to stay up for longer than I thought it would though! It was fun to try another new snow activity. Hopefully though this really is the last we’ll see of the snow this winter. I’m more than ready for some warmer spring weather to arrive now! This is a lovely idea. Genius way to make the snow bricks too, might be worth a try with a larger container for a full size igloo. Hopefully not until next year though!! Thank you Nat – trying it again with a larger container sounds like a fun idea. I’m with you on hoping that we don’t get another opportunity until next winter though! 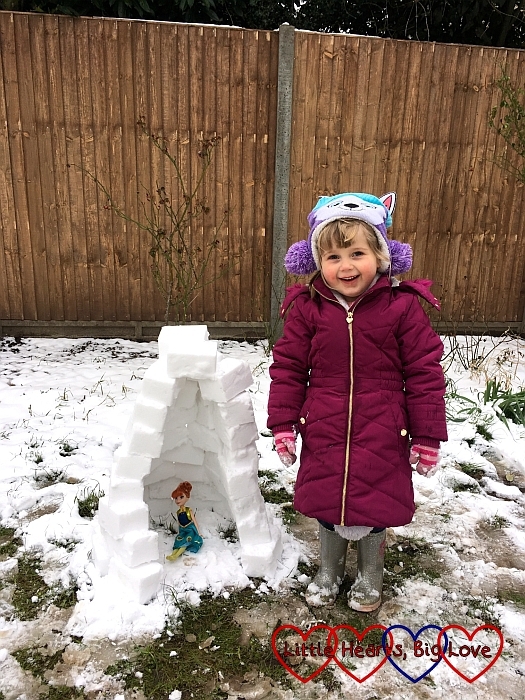 The latest burst of snow was great wasn’t it, it’s lovely that you and Sophie have been able to try out so many different activities. It’s a shame that Jessica didn’t feel like joining you but it’s great that she knows her limits, I’m sure it was lovely for you to have some Mummy Sophie time. I built and igloo with Theo the first snow day this year, it was big enough that Theo could just sit in it, we used an old Ice Cream container. Thanks for sharing your snow fun with me on #CountryKids.